We've just added a cool new visualization to our AdHawk suite of audience measurement tools which provides a real-time view of your beacon network activity. When someone enters the range of a beacon they will pop into view as a circular avatar with a line connecting that avatar to the triggered beacon. Once out of range of the beacon their avatar will disappear. 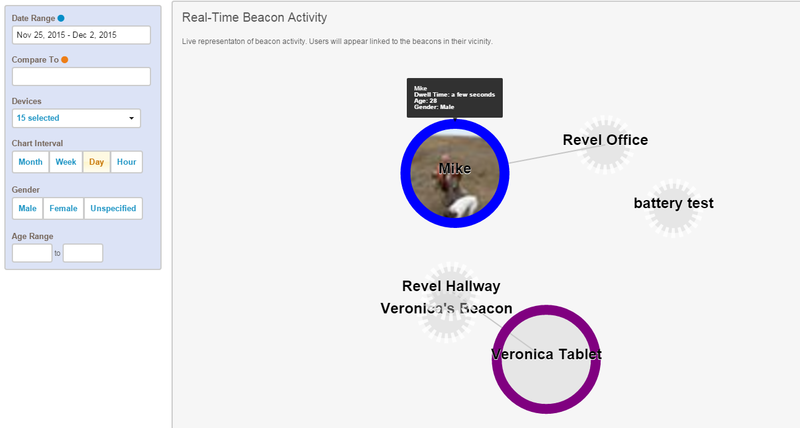 Hovering over an avatar will reveal profile information and a dwell time indicating how long they have been at the beacon. This new tool will allow our users the ability to instantly determine beacon activity level and will even help in initial setup or fine tuning of beacon properties. To see a sample of the tool, along with the other AdHawk charts and visualizations, just click the AdHawk tab in your RevelDigital account. For more information on using beacons with the RevelDigital platform please see our AdHawk page, or contact us directly.